Abstract: This article returns to the historical roots of ECEC and considers them within the context of contemporary international preschool education policy. Present-day policy is characterised by the high level of support directed at this education level. The reasons for this are largely economic and ECEC is becoming part of economic development strategy. Frequently research such as the HighScope Perry Preschool Program can be found in the background. In many ways contemporary ECEC is reminiscent of education policy under communism in Europe. This area represents a concealed spot in the international research on preschool education. The extensive expansion of nursery schools in these countries took place from the middle of the last century onwards. They were the first countries to create preschool curricula at the national level. They also often relied on the first attempt at an early years curriculum, contained in John Amos Comenius’s The School of Infancy (Informatorium of Maternal School). Abstract: Experts agree that character education should start at an early age. However, implementation is often found irregularities. The Ministry of Education and Culture has appointed a number of kindergarten as a pilot project for the implementation of character education. This article reports how the management of character education in kindergarten to be the pilot project. By using a qualitative approach, which attempts to understand the specific situation with the case study method, it was found that kindergarten pilot project has been implemented in an integrated character education in learning through the development of habituation and specialized in the development of a learning theme. Planning the character education program is integrated in the weekly planning (RKM) and daily planning (RKH) and not in the form of an independent program. Implementation of the the character education program conducted through the internalization of the values of the characters in the learning activities using the model in groups with children as a center of learning (student centered). Assessment being applied on character education programs in kindergarten pilot project have not been using special instruments, but still combined with the assessment of child development in general (moral and religious, physical and motor, cognitive, linguistic, social and emotional child). One of the recommendation of this study is the kindergarten should start developing assessment instruments which are specialized in assessing development of learners. Abstract: This study aims to analyze sosiokultur Madurese migrants in Sombo kampong, nurture their early childhood, and the construction of meaning model of early childhood care are regarded as unique. This research approach is qualitative case study type. Data were collected through interviews, observation, and documentation. The findings show that Madurese socioculture migrants in Sombo kampong can be seen from several aspects of life, that they are people who: (1) obey the teachings of Islam; (2) very obedient, submissive, and resigned and hierarchically to Buppa, '(father), Babbu (mother), teachers or Kyai, and Rato (government leaders); (3) has a uniqueness in maintaining kinship, (4) in an effort to establish kinship done by following the recitation, tiba'an, and arisan; (5) irritable, loud, temperamental, vindictive, irritable, and easily suspicious of other people who were suspected; (6) to migrate to survivalitas and dignity; (7) working any lawful as long as it gets results; (8) live in rented rooms, a densely populated neighborhood, slum, and difficult access to clean water; (8) have the courage, firmness, and self-confidence to survive; (9) often received threats of physical violence from colleagues who continues with carok and mostly peacefully; (10) has the openness and honest; (11) said the language is straightforward and rugged; and (12) if receiving insults almost certainly upset with the various levels and forms. 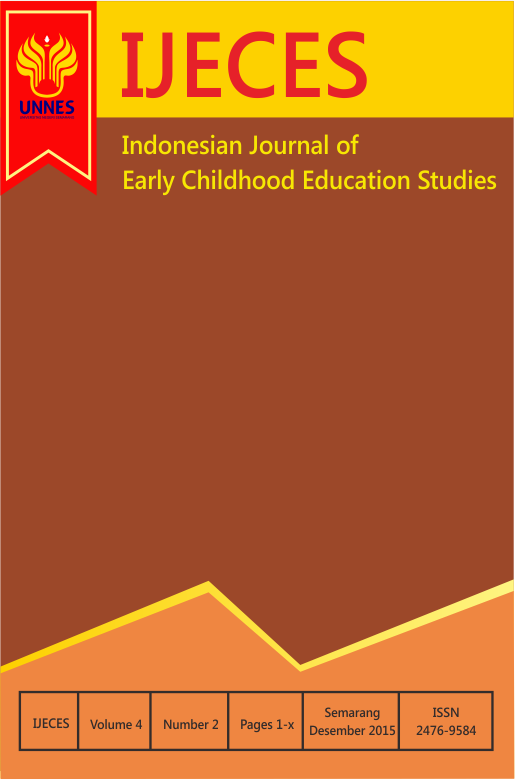 Abstract: This study aims to look at the extent to which the parents perception of the importance of early childhood education (ECD) in Pasar Rebo. Subjects were 105 parents of children aged 3-6 years, both of which have got in early childhood education services or who have not received services in early childhood education or early childhood education service of others. This study uses a quantitative approach and the data collection methods used are questionnaires through the distribution of scores perception of parents using standard deviation formula. The results showed that parents' perceptions of the importance of early childhood education is very important category, 24%, 28% important, 48% fairly important, not important 0%, and 0% very important. The results of these studies indicate that parents do not fully understand that early childhood education is important as an important foundation of individual life in the future. Perception can direct the attitudes and behavior of parents so that when the perception of parents on the importance of positive early childhood education, parenting can be carried out in accordance with the stages of its development. Abstract: Number cards is one of simple media that can be used to help introduce early childhood children to numbers and numeral symbols. Formulation of the problem of this research are, 1) How do we introduce numbers to children by using number cards in PAUD Negeri 2 Banda Aceh' 2) How is the children’s responses to the learning method of numbers introduction by the use of number cards in PAUD Negeri 2 Banda Aceh' The purposes of this research are: 1) to introduce numbers to children by the use of number cards in PAUD Negeri 2 Banda Aceh; 2) to understand childrens’s responses to the learning method of numbers introduction by the use of number cards in PAUD Negeri 2 Banda Aceh. The research is Classrom Action Research (PTK). The research subjects are 25 children of Group A in PAUD Negeri 2 Banda Aceh. The action is combined with stories, games, and contests. Data collection is done by observation and work method. Data analysis technique is using descriptive analysis. Conclusions of this research are; 1) Introducing numbers to early childhood children by using number cards can be done with stories, games, and contests. 2) Students’ responses to the learning method of numbers introduction by the use of picture cards that is done with stories, games, and contests are generally positive. 3) The results of work method about numbers introduction by the use of number cards that is done with stories, games, and contests are generally good at the developmental aspect, that children can compile, sort, and mention numeral symbol corresponding to amount of items in the picture that are shown. Abstract: This paper describes that the children’s speaking ability does not appear suddenly, but through several stages, and it needs to be formed and nurtured from an early age. The children’s speaking ability can also be improved through a variety of ways including through method of role playing. This paper describes and explains the processes adopted to optimize the children’s speaking ability through role playing method. This paper is based on the results of a Classroom Action Research (CAR) conducted in Playgroup of Aisyiyah at Mangli, with the stages of planning, action, observation, and reflection. The Method of role playing improves children's speaking ability, as shown from the scores increasment in pre-cycle which reaches an average of 57, the first cycle of 64.5 and the second cycle of 75.75. The increasment of the speaking ability is followed by children’s attitude changes, are: unembarrassed, speaking expressively, daring to express opinions, expressing various questions, answering multiple questions, and fluently expressing ideas. Abstract: This study aimed at getting an overview of ​​the type of parental education program that have been implemented, getting an overview of parental interest in parental education programs, and getting an overview of the strengths and weaknesses of parental education program that has been running in kindergartens in the region of South Tangerang. This study is explorative with descriptive analysis. The research location was in Pamulang and Serpong, sub district of South Tangerang, Banten. The research subjects are 49 kindergarten principals and teachers. The finding of the research showed that of the type of parental education program varied, but not all types of programs have been done. The Interests of parents to be involved in the parental education program which involves parents in kindergarten were quite high. The main strength of the parental education programs is the theme that meets the needs of parents. It can be a solution for them in solving the problem of child development. The main weakness in parental education program is the lack of parents presence on the program implemented. Therefore, the kindergartens need to think about a better strategy so that participation of parents in parental education programs would be optimal. Moreover, the principals and teachers in kindergartens also need to think about a better strategy to optimize the participation of parents in parental education programs. Abstract: Mat Play Center (‘Gelaran’ Play Center) is another innovation and advance in early childhood learning. In line with the purpose of research, first, pre-development the media of Mat Play Center (Gelaran Play Center) would collect data starting with theoretical framework and information based on the class or the field situation; second, the progress of media development in Mat play centers based on multiple intelligence is conceptual model development, design and products; while the third phase is the stage of the application form of testing the models which running in the field. The results showed in the form of design and media product of Mat play centers based on multiple intelligence that was developed based on the classification of creative play, specifically: the creation of objects; serialize games; creative questions games; creative movement games; as well as creative drama games. Abstract: This research aims to determine differences in the results of improvement in early reading skills of children through the use of media booklet. Sample was taken using purposive sampling taken in kindergarten Kemala Bhayangkari 34 Kendal in B age group 5-6 years. This study used an experimental method Pre-experimental design with the kind of one group pretest posttest design. Collecting data in this study using the method of observation and documentation. The study is divided into 14 sessions (1 time pretest, 12 times of treatment and continued 1 times posttest).The data were analyzed using statistical quantitative analysis methods. The results showed an increase in children's early reading skills in group B with the following details: amounting to 81.82% of children have the ability to bring the beginning of the category as well as 18.18% of the children had a very good early reading skills. Based on statistical calculations get that tcount> ttable, where t-value (+). If the worth (-) then converted mathematically, results were obtained with t-value of -36.516 great while ttable is -2.0369. It can be concluded that Ho rejected and Ha accepted, it means that there are differences in children's early reading skills after using the booklet.